Quang Nam (VNA) – Prime Minister Nguyen Xuan Phuc said he wishes that Chu Lai would strive to become a high-quality agro-forestry processing hub of the country to be able to meet huge demand in ASEAN, northeastern Asia, G7 and G20 countries. 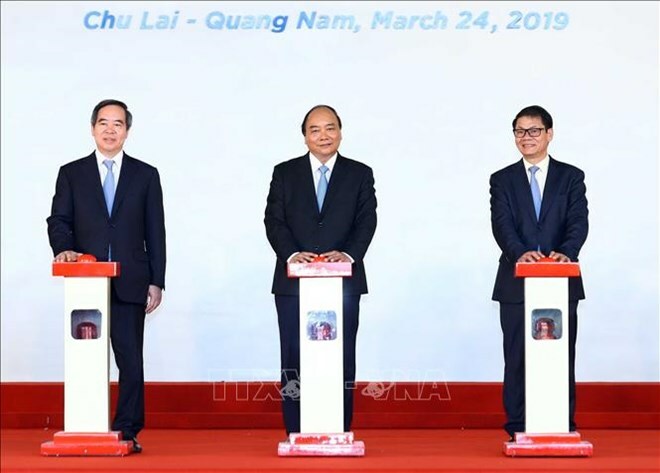 He urged provinces to submit breakthrough mechanisms and policies to the Party Central Committee to improve competitiveness of key economic area in the central and Central Highlands, including Da Nang, Quang Nam and Dung Quat – Quang Ngai. The 450ha agro-forestry industrial park will develop a materials farming area for the central, Central Highlands and neighbouring Laos and Cambodia. It will be built from 2019 to 2022 at a total cost of over 8.1 trillion VND (352 million USD). On the occasion, automaker Thaco Truong Hai began construction of an expanded automotive mechanical industrial zone on a total area of 115ha. Costing over 1.6 trillion VND, the work is expected to increase locally-made items for automobiles to more than 40 percent, thus meeting demand for export to ASEAN member states by 2020. The management board of Chu Lai Open Economic Zone also granted an investment license to Thadi industrial, agricultural, forestry park. Thaco Truong Hai also signed strategic contracts with domestic and foreign firms to supply clean farm produce. Build in 2003, the Chu Lai Open Economic Zone is the first coastal economic zone in Vietnam. It is strategically located midway between Vietnam’s northern and southern regions, and connected to National Highway 1A, national coastal routes, the trans-national railway, Ky Ha seaport, Chu Lai airport, and the Da Nang-Quang Ngai Expressway.